As I write this, it’s Go Green Week at Cardiff Met, and there are a whole host of ways to get involved in reducing our environmental impact and taking action on climate change around campus. For Christmas, my step sister bought me a little note book with the days of the week on. I decided to start using it to plan my week’s meals in and I have never looked back! Planning my meals means I save a lot of money on my food shops as I impulse buy a lot less, and it has also massively reduced my environmental impact. I throw so much less food away then I did in my first year at uni. 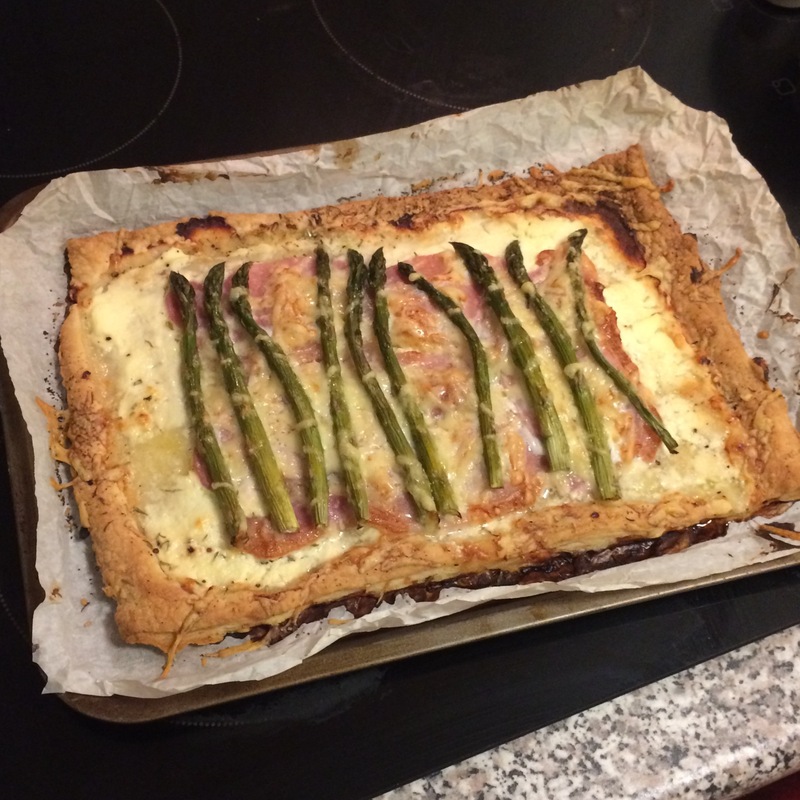 For more on cooking at uni, read my Six Tips For Becoming A Better Cook At University. With a bit of planning you can eat better and waste less! 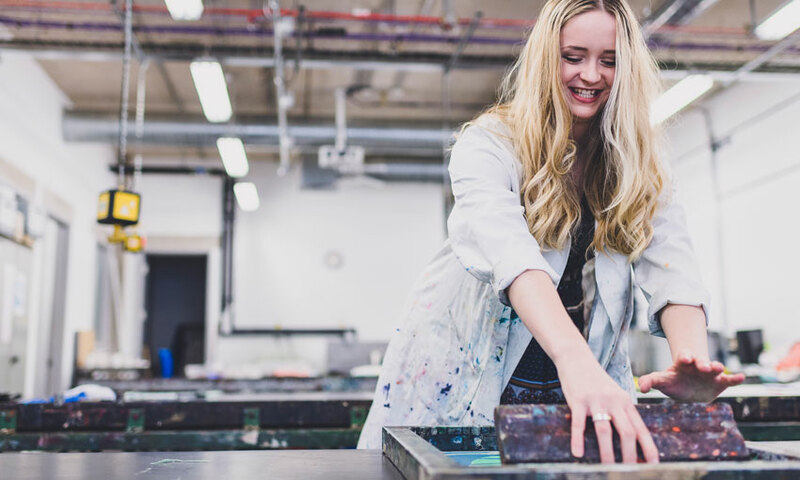 Printing at uni can be costly for you personally, and the environment. As an art student, I find it’s very easy to print off piles and piles of paper a day, which is why I decided to make the switch to using my blog for all of my research and reflections on my work. By making this switch, there have been a huge number of benefits. I have saved a lot of money on paper and a lot of time that would have been spent stood at a printer. All of my work is at my fingertips whenever I want it, so I can send my body of work to perspective employers quickly and easily. My work is organised effortlessly into categories, which has meant lecturers can find my work to mark much more easily, and I can embed Pinterest boards, YouTube videos and Screen Shots in seconds. As an added bonus, it is much better for the environment. I have written over 250 blog posts since beginning my course – I dread to think how much paper that would have been! Starbucks and Costa (we have both on campus in Llandaff) offer 25p off drinks when a reusable cup is used. 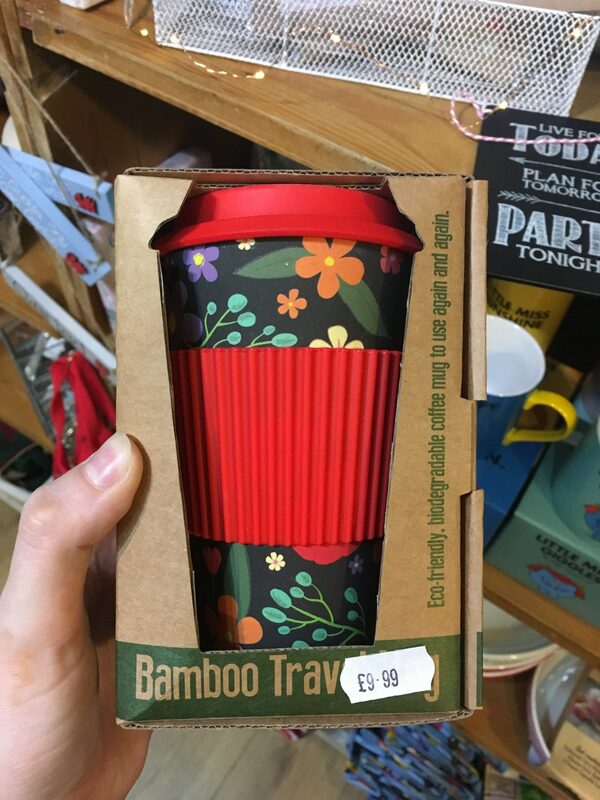 A huge number of travel mugs are available online, but I found this Bamboo Travel Mug in Cardiff the other day for £9.99. If I have one coffee a week for a year at uni, I will have paid for the travel mug and saved 40 non-recyclable cups from being sent to landfill. Small changes like this really can make a difference. This is not as bad as it sounds! Recently, we had David Hiut, from Hiut Denim Co. come in to CSAD and talk to us about his career and design ethos. Part of his talk was on his ‘No Wash Club’ concept. Not washing your jeans means they last longer and fit you better while hugely reducing your environmental impact. Putting them in a bag in the freezer at the end of the day destroys the bacteria on your jeans while retaining the fit. According to Hiut’s calculations, wearing and washing a pair of jeans following their guidelines can reduce water use by a massive 952 litres and save over 6kg of CO2 emissions over the life of one pair. 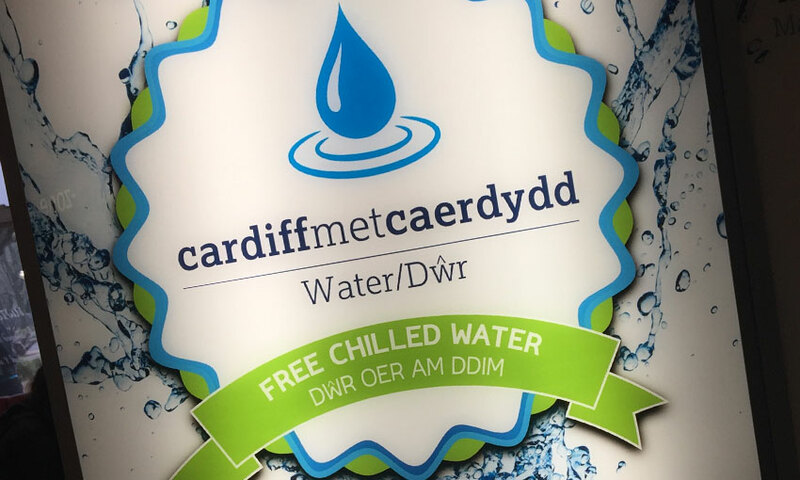 Water refill stations are available all of Cardiff Met’s campuses, and buying a reusable bottle and bringing it to uni empty means that your bag will be much lighter on the walk in – plus your water will be perfectly chilled. There is also a growing trend to buy fruit diffuser water bottles, like this one, so that you can have flavoured water without the chemical additives and environmental impact. There are free water vending machines all over campus. Charity Shops are a brilliant way to save money as a student, reduce what is sent to landfill, and support a good cause at the same time. They can be time consuming to sift through, but it’s really worth it when you find a gem. I recently bought three Ted Baker dresses with the tags still on in a charity shop – there’s no way I could have afforded to buy them otherwise! The University is the featured partner for environmental charity Size of Wales. It’s an amazing organisation working to preserve an area of rainforest that is, you guessed it, the size of Wales. Supporting local causes like this helps give Wales a good name while protecting vital rainforest habitat. You can support this great cause either financially, or with your time and skills. Brands listen to what the consumer wants. As consumers, we can support the causes we believe in with our money. There are some great brands out there that are making a positive difference, as well as some who are less responsible – do your research and vote with your wallet. Personally, I’m a fan of People Tree, a sustainable, fair trade fashion store, and ASOS’ EcoEdit initiative. This might be the most important. As students, we are the next generation of policy makers, designers, influencers and workers. Putting our money, energy and voices behind the causes we need to be passionate about, like sustainability, is important for all of our futures. Whether you’re an art, sport, business or science student, there are a huge number of causes and people out there that need our support. Make an effort to be aware of what’s happening in the world – it’s easy to live in your own little bubble at uni, but being aware of the wider picture is so important for creating the future we want to live in.